Any Outlook power user knows that Microsoft Outlook is more than just an email program: it's a suite of organizational tools that can help you manage your schedule, contacts and deadlines with remarkable efficiency. Outlook contains such a wealth of features that even the most experienced users find that there is always something new that they can master. 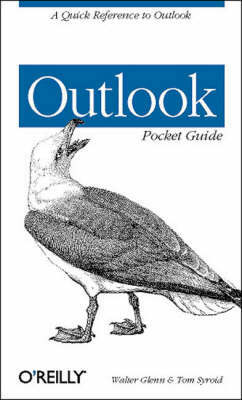 Whether you are a power user, help desk staff, or just someone who wants to harness the full strength of this program, you'll find that the "Outlook Pocket Guide" significantly decreases the amount of time you spend trying to figure out tricky questions. It provides just what you need, when you need it, right at your fingertips. Packed with information, this compact guide is a highly utilitarian tool that covers Microsoft Outlook's keyboard shortcuts, user interface, commands and tasks. The book is easy to use anywhere and includes: a brief explanation of how Outlook works behind the scenes; an extensive guide section for common tasks as well as little-known solutions; and reference tables for keyboard shortcuts, regular expressions, and common file locations.